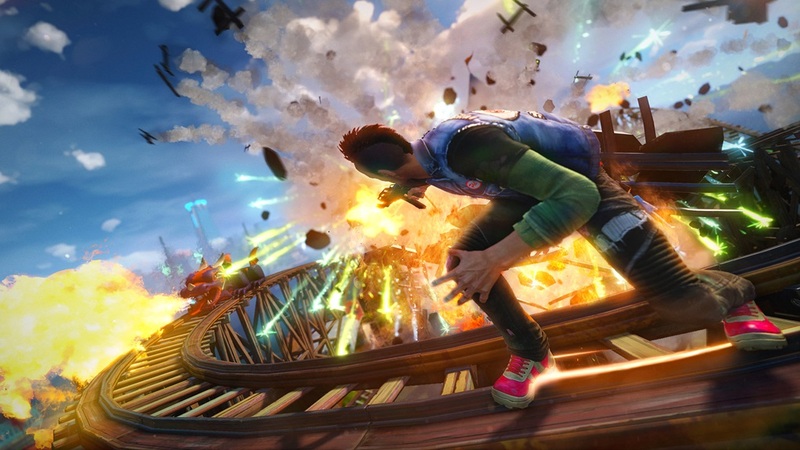 Sunset Overdrive is all about keeping on the move. It’s about grinding, bouncing, flipping and jumping – and thankfully, the game world is full of rails, fences and wires to help you do that. It’s also full of cars, canopies and other objects that let you bounce to reach the wires and fences that you’ll grind along. 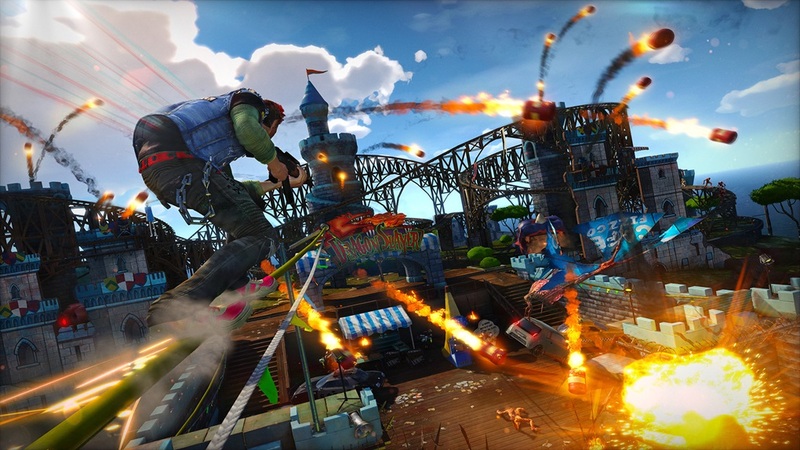 Sunset Overdrive is a game that encourages you to stay off the ground. The game’s disembodied voice announcer reminds you as much several times during the game. Importantly, though, Sunset Overdrive is fun. Lots and lots of fun. I mean, how can grinding along a power line, jumping off and bouncing off an umbrella then wall running the side of a building – all the while blowing up mutants with a toy teddy bear strapped with TNT not be fun? Sunset Overdrive reminds me of lots of other games: Crackdown, the Tony Hawk series, Jet Set Radio, Bulletstorm, even the classic Tower Defence, but it’s tone is dramatically different from developer Insomniac’s last game, Resistance 3. 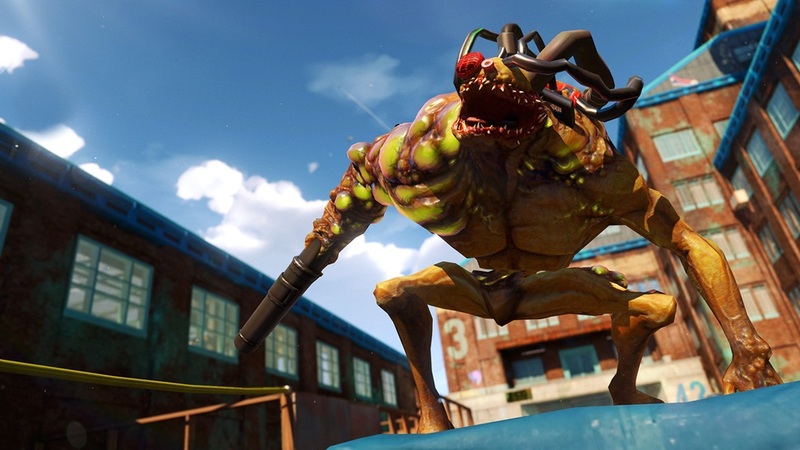 Yeah, both have mutants that are out to get you in it but where Resistance 3’s setting was dark, brooding and scary at times, Sunset Overdrive’s locations are brightly coloured, almost playful environments, and, dear I say it, almost cheery despite the mutated humans taking over the city. Set in 2027, the game’s mutants are called The OD (Over Dosed) after they consuming a bad batch of Fizzco’s new energy drink Overcharge at a launch party. The OD come in a variety of forms: Poppers have heads that expand then explode, like a pus-filled pimple, when they’re close to you; The Blower has an arm that fires out green acid; the Gunker can freeze its surrounds. There’s also other monsters (a giant one seems to have digger buckets for a left hand), as well as rival human gangs that survived the Overcharge incident, called Scabs. Sunset Overdrive has a humourous tone to it – it doesn’t take itself too seriously – but it was a bit annoying that the game felt it had to remind me sometimes that it was a video game within a video game. I know that it’s an escape from reality so I don’t need the game’s makers to tell me that. The weapons are inventive enough, too. The TNTeddy fires, well, teddy bears with explosives attached to them. There’s a weapon that fires old vinyl records. There’s another one that freezes enemies so you can drop down and smash them to tiny pieces. I got completely confused how to use the weapon upgrades called Amps but a nice touch is that sometimes when you blow up something, say a swollen-headed Popper, the word “boom”or “pop” is spelled out in the orange explosion. It’s a nice touch. Talking of nice touches, I really like the re-spawn sequences when you die. Insomniac weren’t content with just re-spawning you on the same spot, in the same way, no. When you die in Sunset Overdrive – and you will (whether it’s because you miss-timed the jump from one grind rail to another on an apartment building or you’re overwhelmed by OD) the re-spawn animations are different: One time you’ll pop out of a phone box doing a karate kick, another time you’ll be dropped from a UFO, yet another time you’ll rise from a sarcophagus and do a mummy walk. It just reinforces the light-hearted approach Insomniac have taken here. If I have one fear for Sunset Overdrive it’s this: That its multitude of fetch quests and samey mission structure, could get tiresome after after a few hours. I mean, there’s only so much grinding, bouncing, and flipping you can do on the way to yet another fetch quest before you’ve had enough. To be honest, it’s taken a while for decent exclusives to appear on the Xbox One, but just like the recently released Forza Horizon 2, it seems the Xbox One is now starting to come into its own as a games machine. Owners of Microsoft’s machine now have something else to cheer about. Xbox NZ kindly provided a digital copy of Sunset Overdrive for this review. Note: I haven’t had time to check out Sunset Overdrive’s Chaos Mode, an online mode for up to eight players but when I get the chance, I’ll give it a whirl.